Pendleton offers the best golf lessons, with the best most experienced PGA Professional! 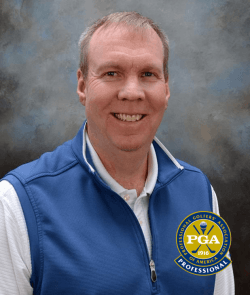 Our Director of Golf Jim Mason, has been PGA professional since 1995. Never trust your golf game to a rookie. Save time, money and frustration by learning from the best most experienced golf pro in the area. Especially when you consider the prices! My name is Jim Mason, and working as a PGA professional and teaching golf has been my passion for over 30 years. I don't care what skill level you are, from beginner to tournament player, I can make your game better. It all starts with an introductory video lesson. I use the popular V-1 golf software to analyze your swing. You keep the analysis of your golf swing along with specially assigned drills that are appropriate for your specific swing fault. Your entire golf lesson is recorded, and I will send it to you to watch as often as you like. Interested in Instruction? Fill out the form below.